Photo from the No. 1 Outdoors Post of 2011. 10. World-record great white shark caught and released by 'Shark Men.' One of the most popular posts. Of course, anything half-way decent with great white sharks will command attention. See how the Shark Men catch and release a world-record great white shark right this way. 9. Fishing technique never seen before. Fishing fun with Photoshop, or the video equivalent. Very clever, very creative, very funny. See the short film here. 8. Surfing 'Jaws' at night. Aussie Mark Visser claims to have become the first to surf Jaws at night and here is proof. 7. Slacklining over Yosemite Falls. Daring and perhaps foolish, Dean Potter pushes the limits of extreme sports by slacklining (or highlining) over Yosemite Falls in Yosemite National Park. Even if he does have a safety line, it’s still a fascinating watch. 6. Humpback whale rescued from gillnets in Sea of Cortez. An amazing rescue captured on film and the incredible show of thanks shown by the whale at the end. 5. Mountain biking magic. If there is such a thing as poetry on a mountain bike, stunt artist Danny MacAskill performs it with incredible aplomb. And you gotta see him ride an unstable cable. Must see to believe. 4. Inuits go ice fishing for sharks. Ice fishing for sharks? Really? Yes, really. See how the Inuits catch a 1,000-pound shark and get it through the hole in the ice. Is this sailboat sinking? See the No. 3 Outdoors Post of 2011. 3. Sinking sailboat is a piece of art. 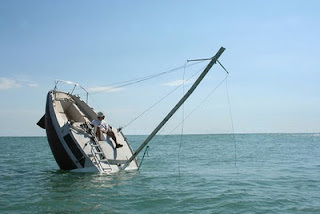 When is a sinking sailboat NOT a sinking sailboat? When it is a sailboat that only looks like it’s sinking. It’s called the Love Love Boat, and we think you’ll love, love it. See if it's really sinking. 2. Yosemite: Highlining at 3,000 feet without a harness. Mich Kemeter offers an adrenaline rush in this video of him crossing a 99-foot-long, one-inch-wide rope at Taft Point in Yosemite National Park -- WITHOUT A SAFETY HARNESS. The craziness is right here. 1. 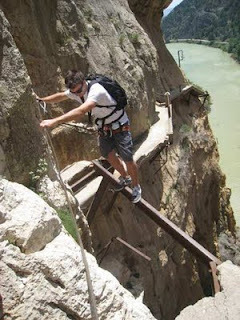 Scariest hiking trail in the world. The No. 1 Outdoors Blog Post of 2011 is without question this video of the El Caminito del Rey or The King’s Little Pathway, located in the province of Malaga, Spain. Watch the video and hold your breath. And watch your step! Click here and be amazed.